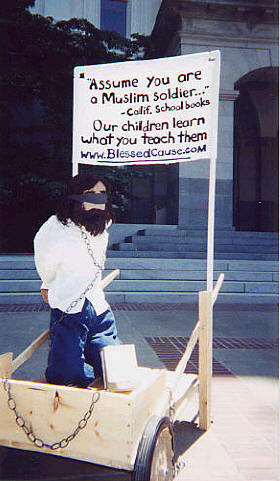 It's own form of artwork...3d art, in front of Sacramento in protest of textbooks. This really stirred up curiosity and many took the flier addressed to (then) Gov. Davis. I knew very little about politics, where or when to demonstrate. To my surprise, there was a meeting that day of educrats in the capitol, on that very afternoon. And everyone who took a flier was shocked at what was written in the textbooks, many said it couldn't be true. And I often thought about doing something similar with this idea of a 3d protest with a cardboard crowd around it, but a senator cautioned me against it.